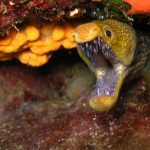 The ideal place to scuba dive has to be Crete, the underwater world in Crete is amazingly beautiful filled with shoals of rare fish and mini reefs holding assorted colourful fish and the likes of Moray eels. If you want to go Crete scuba diving then there are many planes and ships that were sunk or lost during the battle of Crete and the scuba diving companies on the island will take you down there. In order to view the best that Crete has to offer underwater its recommended you are fully qualified, but even if you are not the diving centres on the island are happy to train you up and take you on your first ever dive into the Cretan Sea. There are many companies in Crete that will take you scuba diving in many different areas of Crete. The most popular area to dive are in Hersonissos and Gouves. 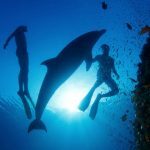 If you have never been diving before you can get certified here and learn quite easily, starting of with pool dives, shallow sea dives then onto other more complex dives if your up to it. 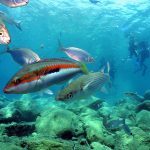 If you need to learn the you can choose from booking a trip through a local travel agent who usually know the best companies who offer Crete scuba diving. Just 20km West of Agia Pelagia lies the wreck of a German WWII Messerschmitt 109 fighter, lying 800m offshore, in a depth of 24m. It is to be found lying upside down, broken into several pieces. The wings and fuselage are intact and you can see inside the cockpit. One of the machine guns is clearly visible & one of the ammunition belts, lies on the sea bed. One wheel is still attached, and the other lies a few meters from the wreck. The tail of the plane was evidently sheared off upon impact as it can be found some 50m away from the fuselage at a slightly deeper depth of 30m. The exact cause of the crash is yet to be discovered. Over the years the wreck has gradually built up a blanket of plant life and become host to large groupers and moray eels. The area surrounding the wreck is sandy, but there is a small reef about 20m away, at a depth of 24m. This is a deep dive and only recommended for experienced divers. The wreck is known in Greek as Navagio, and its one of the most popular dive sites within Crete. If your thinking of taking a diving holiday in Crete then this is well recommended. 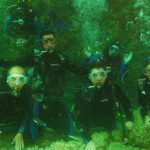 Remember though that if you are not so experienced there are plenty more easier dives to go on and local dive firms all round Crete can advise you on what’s best for your level.